We consider it a privilege to be a part of your Parelli journey. 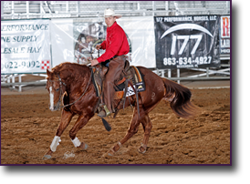 The Parelli program and we as Licensed Parelli Professionals offer several paths that will that lead you to better horsemanship, and a better relationship with your horse. Participating with your horse in lessons, workshops, and clinics is the pathway for accelerated learning. Attending an event as a gallery student can provide great insight and be a very meaningful learning experience. We would love to have you travel to The Horseman’s Word Ranch for your lessons, but we are also able to travel to you to support your learning. Contact us for details. Lessons range from 1 to 3 hours in length. Rates quoted are per person for each hour. 1 Student ~ $60.00 for Parelli Savvy Club Member, $70 Regular Price. 2 students ~$35 for Parelli Savvy Club Member, $45 Regular Price. 3-5 students, 2-3 hours ~ $30 per student per hour for Parelli Savvy Club Members, $40 per hour Regular Price. and a copy of insurance is available upon request. Pat Parelli says there are only two reasons our horse doesn’t do what we ask: either we’re asking the wrong question, or we’re asking the wrong way. Lessons with Todd and Maureen help humans and horses understand each other. Personalized instruction gives you the opportunity to focus on the challenges you face in the moment, under the watchful guidance of a Licensed Parelli Professional. We are qualified to instruct you from the very beginning of your Parelli journey through the progressive education levels, as far as and including Level 4. It is a pleasure for us to be with students who are committed to being a bit better for their horse every day. 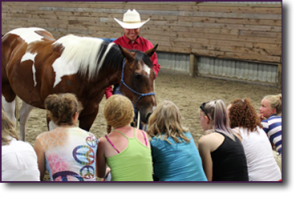 Parelli Clinics give you and your horse the opportunity for an extended learning experience in a supportive group environment. 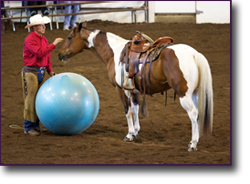 Many of our clinics feature some of the top Parelli Professionals in the world as guest instructors. Whether you participate as a rider, or watch and learn as a gallery student, you will come away with new knowledge and skills that will improve your horsemanship regardless of your current discipline or riding ability. 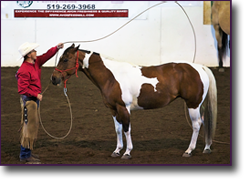 Trailer your horse to The Horseman’s Word Ranch in Uxbridge and have your lesson or attend a clinic in an environment designed for learning. Our facility has 30 acres of Parelli playground where you can challenge yourself and your horse with Parelli obstacles, practice your trailer loading, let your horse swim in our large spring water ponds, or ride our wooded trails. Our Parelli honeycomb is the perfect place to practice On-Line and Liberty Savvys. Our heated/AC classroom has a huge library of Parelli educational material. We realize that time and distance can sometimes make it difficult to schedule lessons or attend clinics. That’s why Parelli offers self-learning articles and video lessons that can be accessed on-line through the Parelli Savvy Club. And we also offer complete courses in each Savvy at all levels on DVD. Contact us for more information on how you can take advantage of these Home-Study aids. The first Savvy, On Line, has proven to be the most successful Parelli entry point for hundreds of thousands of students across the globe. The skills and knowledge you will gain in the On Line Savvy will set you – and your horse – up for a lifetime of safe, fun, progressive, natural partnership. The Liberty Savvy is the ultimate truth test for your relationship with your horse. Liberty helps your horse work with his “gymnastic improvement”, or overall athletic capability. Liberty is all about developing a true partnership with your horse on the ground, with no strings (or lead ropes) attached. 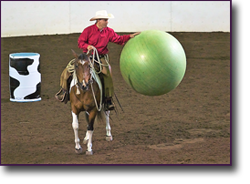 Freestyle Savvy – riding with a loose rein – is an essential component of any well-rounded horsemanship education. As your riding skills improve and your horse gains confidence, you’ll have more fun together than you ever thought possible. And really, isn’t that what it’s all about? Finesse, or riding with contact, is the fourth Parelli Savvy, and the one that relates most directly to performance. Whether you’re an English or Western rider, developing an understanding of bit contact, precision and vertical flexion is essential to becoming a well-rounded, skilled horseman. Even if performance sports aren’t in your future, the skills and techniques you develop by incorporating the bit will advance your riding in leaps and bounds. We hope to see you soon at The Horseman’s Word Ranch in Uxbridge.